From left: Greg McNee, Senior Director Software Development at SMART Technologies and Shoreline instructors Keith Smith, Jeff Purdy, and Kory Dean. Far right: EPSON Prosix robotic arm. Photo courtesy Shoreline CC. 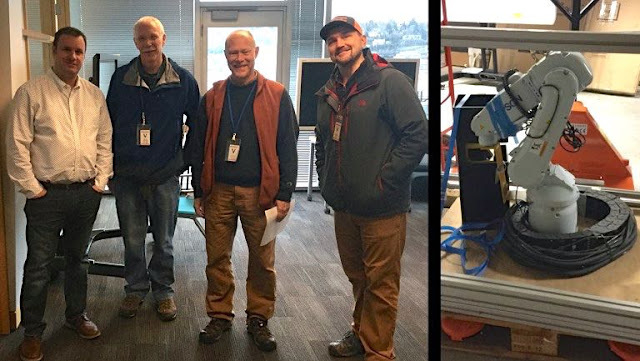 SMART Technologies in Seattle recently donated an Epson Prosix robotic arm to Shoreline Community College’s Mechatronics program, diversifying the robotics education students gain at the College. Students currently train on five FANUC robots including a welding robot. The Epson Prosix is a six-axis arm on a linear rail, allowing the robot to operate in a larger space than Shoreline’s current arms. SMART Technologies had been looking for a home for the arm when Jim Eanes, a software development engineer at the company, saw an article about the College’s Mechatronics program in The Seattle Times and reached out to Shoreline. Instructors had already been discussing expanding the robot types offered in the program when SMART made contact about the arm. “It was a win-win,” said Purdy. The arm arrived at Shoreline’s facility March 2, and students will begin training on it as soon as it’s assembled at the College. Learn more about Shoreline’s Mechatronics program.